Apples to Apples To Go is the portable version of the wild, award-winning card and party game that provides totally portable fun for four to eight players! It's as easy as "comparing apples to apples"... just open the box, deal the cards, and you're ready to play! Select the card from your hand that you think is best described by a card played by the judge. If the judge picks your card, you win that round. And everyone gets a chance to be the judge! Each round is filled with surprising and outrageous comparisons from a wide range of people, places, things and events. 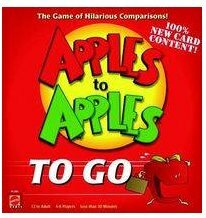 Fast moving and refreshing, Apples to Apples To Go is the perfect game for fun on the run! This travel version is very handy to take on a trip when your luggage just can't hold the bigger games. Apples to apples is a classic party game that start interesting conversations and is guaranteed to make you laugh. Definitely give this version a try if you're looking to try it out!